Performance The performance of my pre 1900 play, (Electra) I believe was not performed to the best of my ability. 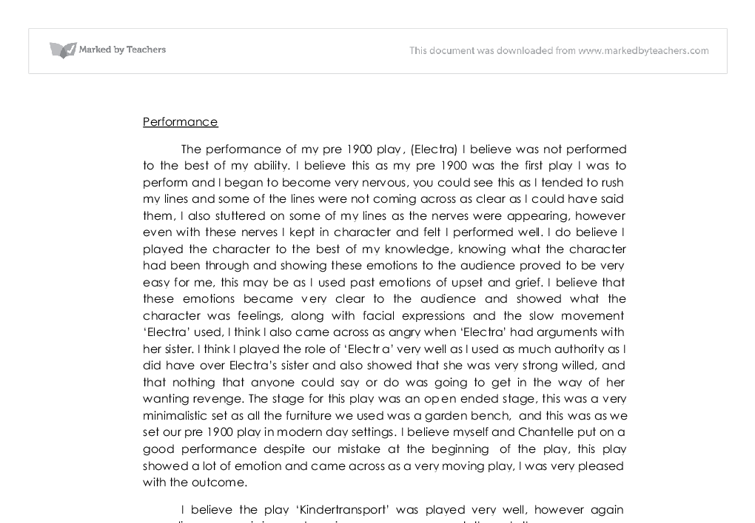 I believe this as my pre 1900 was the first play I was to perform and I began to become very nervous, you could see this as I tended to rush my lines and some of the lines were not coming across as clear as I could have said them, I also stuttered on some of my lines as the nerves were appearing, however even with these nerves I kept in character and felt I performed well. I do believe I played the character to the best of my knowledge, knowing what the character had been through and showing these emotions to the audience proved to be very easy for me, this may be as I used past emotions of upset and grief. I believe that these emotions became very clear to the audience and showed what the character was feelings, along with facial expressions and the slow movement 'Electra' used, I think I also came across as angry when 'Electra' had arguments with her sister. ...read more. nerves were still present they did not show within my acting or the way my lines came across, even though some of the lines were missing in this play the audience did not notice and the characters were still on stage, we picked up the lines and carried on, I thought this play was performed very well. My character came across as a very doting mother trying to do the best for her daughter. I believe I played this very well and also had a settle quite tone in my voice to show how much she cared for her daughter, I myself believed that I was the mother of this young girl and acted this out as I was the character, I believe this also came across this way to the audience. I think myself and Chantelle performed this very well and showed the mother daughter tension and also the mother daughter love in this scene. ...read more. I think this was performed to my very best and this showed. I became very upset when I knew our Country was at war and also became upset whilst reading a letter from 'Mags.' All movement was carefully thought through and speech was projected even when the scenes were very tense and upsetting. I kept eye contact with other characters throughout this performance where it was needed. As there were four characters in this play it was essential that we were all together to rehearse, however on occasions this was not possible, therefore we had someone speak in for the characters that were not present. Despite not having a lot of rehearsals I think this was the strongest play in which I had performed throughout my drama exam, we received a very positive feedback from the audience and all felt pleased within ourselves that we had put on a brilliant performance. ...read more. then began to lift my hand up to my mouth to show the action of drinking. Other actions I used in the scene were to drewel over the gentleman sandwiches in hope he would maybe leave apiece in pity of my hunger and I.
Nell: Lucy right? I have heard a lot about you, you are very pretty you know. Lucy: thanks, but I have to go and see someone tonight, so if you don't mind, can you excuse me. Nell: Where the hell do you think you are going, I paid �20 on you, and am not allowing it to go to waste, come here. Our intention with the dance was to confuse our audience so they had to think about what they were seeing, a typical trait of Brecht. We also wanted to use a sharp contrast in the style of music and the dance, we had used contempary dance before with brilliant results so decided to incorporate it into this performance. It's easy to empathise with the hero of a story because normally he is under a lot of pressure from the rest of the cast, I find there is just something about them which we love maybe it's because we are meant to rather than because we want to. We layered all the voices, making the audience wait for the climax, with many degrees of vocal tone and a texture of sounds. We then improvised a scene in which we had the mother and children preparing for the fathers arrival home. She also appears shoeless which suggest that she has freed herself from the class system, as an individual without shoes is normally associated with the lower class, however she comes from nobility, which previously was one of the elements that oppressed her, also she is presented with wild hair illuminating a feral nature.